Charity bequests were once common place in England. 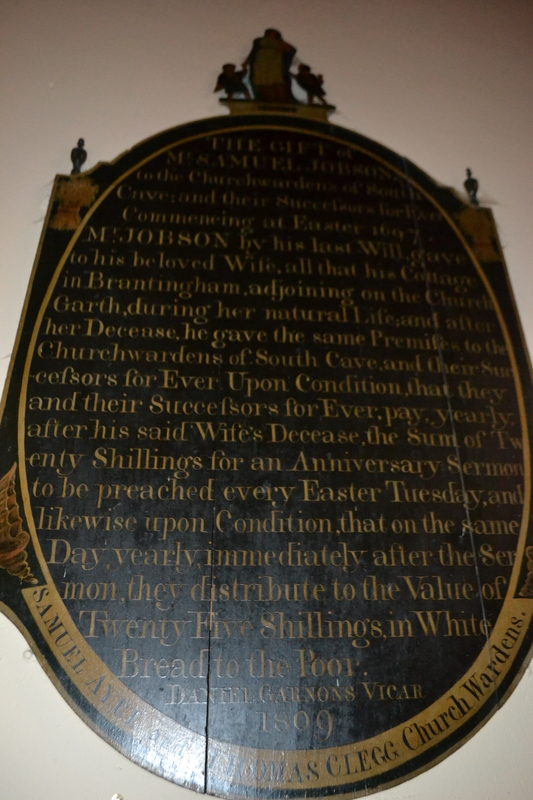 Each Parish church would have its own charity and many proudly announce these on Benefactor Boards on the walls. However, many of these died out. Some were lost due to the hyper inflations of the First World War, others survived either in an amalgamated form, usually with the gift bequests commuted to money. Samuel Jobson’s bread charity is thus a rare survival. It is similarly unusual because it is affixed to a special sermon, like the Hercules Clay sermon of Newark, which is delivered on the first Tuesday after Easter. Why it was after the first Tuesday is perhaps first unclear. Samuel Jobson was a local man, both being baptised in 1623 in All Saints Church, South Cave and buried in that church in 1687. His church survives him, as it has a fire and various rebuilds. Rebuilds appear to be the order of the day in this village. The castle, a grandiose mock castle sitting upon a real one and even the nearby holy well has been rebuilt into a wishing well! South Cave, an ancient Saxon settlement, now resembles a typical Georgian village, set mainly along its main Market Street but subsequently as the population has grown spread along side streets. Jobson being steward to the castle was no doubt a familiar man in the mid-1600s. I arrived at the church just on time as the service was about to begin and was warmly welcomed by its small congregation huddled to hear this most unique of survivals, an endowed service. Indeed, a number of churches still give out their bread charities but few if any do it as fully instructed by their benefactors. The closest being the Hercules Clay service but that has now absorbed into the normal pattern of Sunday services. 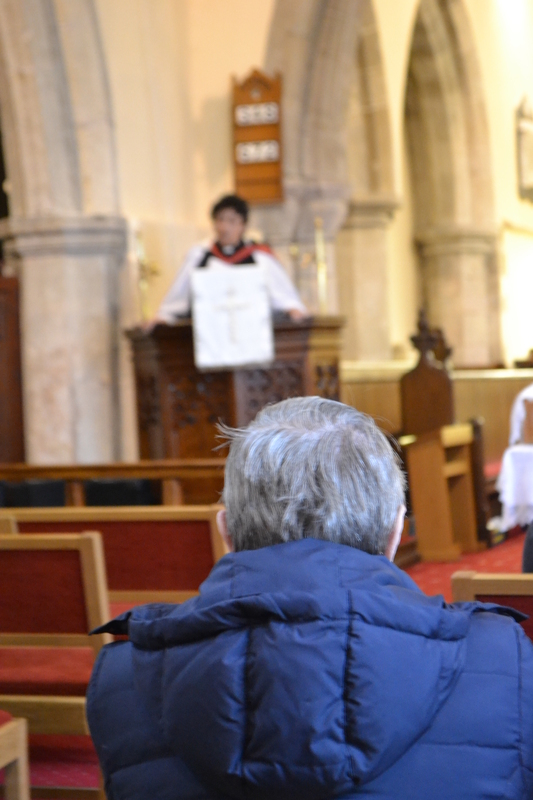 As the curate Lynda Kelly noted in her service, Jobson stipulated that the service must include, the Collect, The Lord’s Prayer and the Sermon, all regular features of the fairly new Church of England and still pivotal today. Why was he so prescriptive? Perhaps he was wary to ensure that the clergy did their job properly, perhaps he had been disappointed by the services he had attended? The clergy were dependent on such endowed sermons and he may have thought as he was providing the money he wanted the full works! Jobson is very prominent in the church. 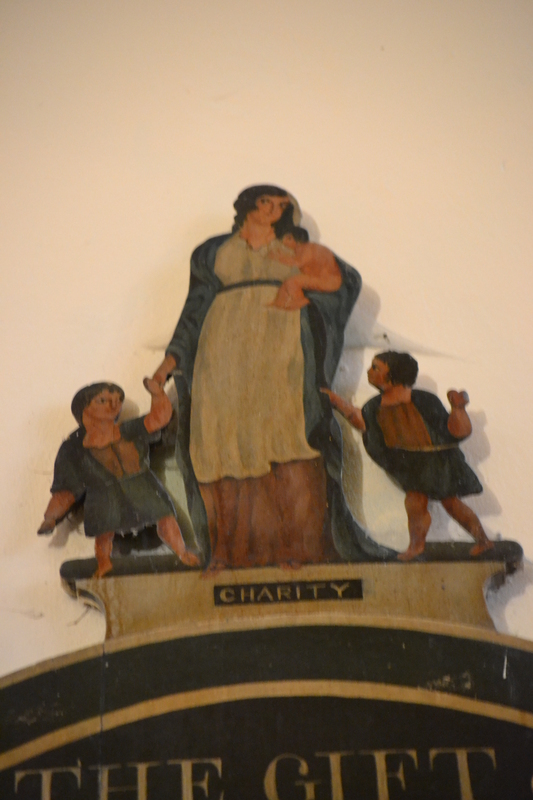 A brass plaque near the old font records his interment and in the church tower is a splendid benefactor board as noted with the usual figures of a women with two children and the words charity below. So each year one pound would be paid each year for an anniversary sermon to be preached on the Tuesday after Easter and after this sermon white bread would be distributed to the poor. So every year the vicar would sermonise on the man and state how generous man. Interestingly the Will also records how generous he indeed was. It is noted that 20s per annum would be given to the master of the workhouse towards providing a dinner for the poor people therein at Christmas and Cave fair and the remainder for providing white bread for widows and other necessitous poor on the last Sunday in every month by the churchwardens. Of course the workhouse is no more, but apparently gifts are still made at Christmas. Indeed the need for charity in the area was thought so necessary that in 1883 the Charity Commissioners who had took over its running decided to extend the charity to Flaxfleet and Broomfleet and give the running to 14 trustees who would meet quarterly. So the service, which begun with a hymn, then continued to the Collect, Lord’s Prayer and then the Sermon. Jobson’s aim with his endowment was to continue the preservation of name and his charitable acts associated with it, I think he would have been happy with the sermon. It did discuss his benefaction explaining why it was established on Easter Tuesday. This he had done because he would be aware that people would have been off work and would be available to listen. Perhaps not being prominent enough to have it associated with the main days of Easter this was the best thing. The Reverend Mike Proctor, the church’s vicar suggested that perhaps he secretly disliked vicars as having a service on this day after the busiest four days in the church was a good way of killing one off! The sermon continued to reflect upon being a Christian and parts of the Easter story referencing the fact that the women found Jesus first. This lead to a discussion of the increasing role of women in the church, a thought not lost upon its mainly female congregation and its female curate. Indeed, Jobson himself was considerate of his wife more than other benefactors, who only left portions of their money at death. An unusual stipulation which clearly was devised to ensure she lived in good comfort and explains the later date of the bequest starting which does not start until 1697, the year his wife died! After the sermon the basket of small white loaves, which had been centre of the raised dais, was revealed. 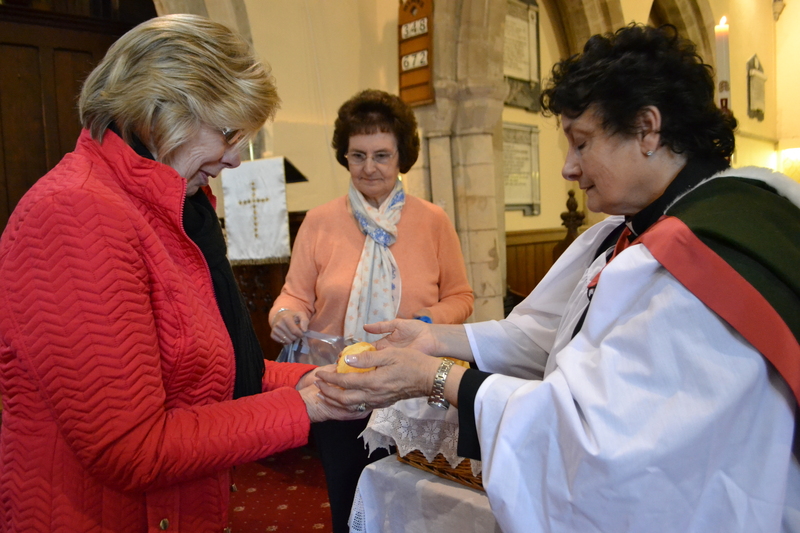 The curate and churchwarden stood either side of it as the congregation lined up to collect their bread. 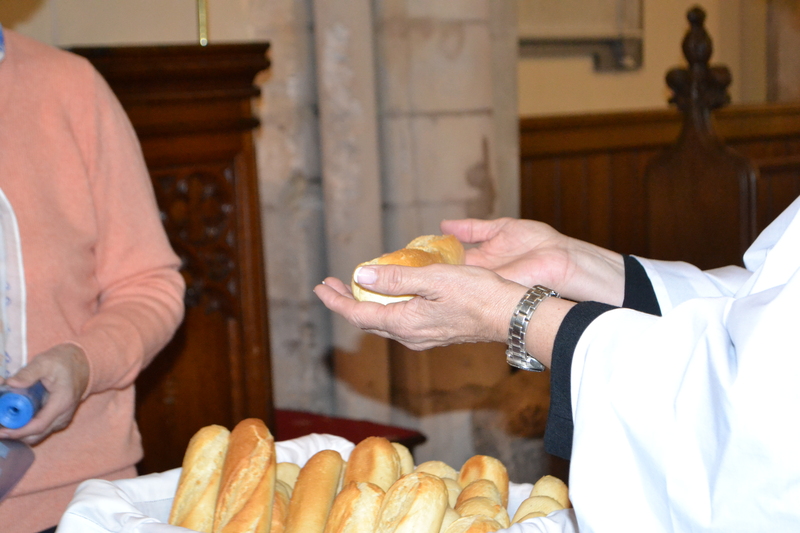 With flattened hands as in offering, the bread was placed in the curate’s and ceremonially passed over. The churchwarden offered a plastic bag for practical purposes. 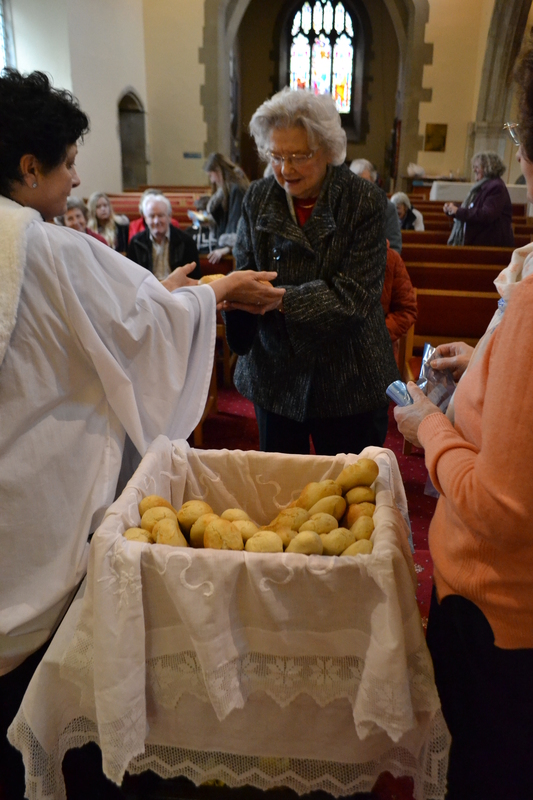 Soon the bread was all gone and the spares packaged up for those of the congregation unable to attend that day. The final bread was kindly given to me, which provided a nice lunch! Today with wholegrains, spelt, organic and sourdough, we might turn our noses up at white bread. Yet of course in Jobson’s day, white bread was indeed a luxury compared to the dirt and rat dropping infested usual bread. Then the congregation returned to their pews and we finished off with a rousing Thine is the glory and the service was concluded – a short half an hour or so. A simple service, but one still of great importance, 300 odd years on remembering generosity and charity in a day it very easy to forget such things. The Jobson Charity a little known charity – it is absent from all surveys – except Tony Foxworthy’s Customs of Yorkshire – but one despite its simplicity should be better known.